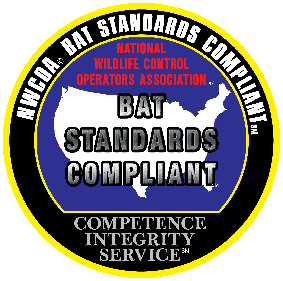 The purpose of the NWCOA Bat Standards is to define the National Wildlife Control Operators Association (NWCOA®) Standards of Practice and to establish a minimum uniform standard for Wildlife Control Operators (WCO) in the performance of work related to bats and resolving conflicts between humans, bats, and structures. 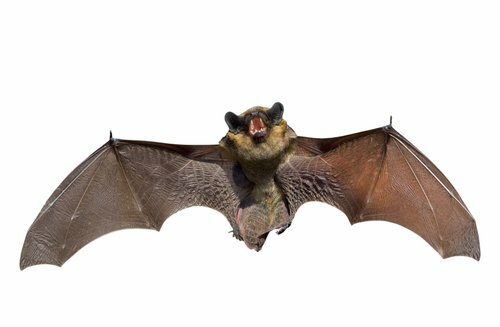 It is NWCOA’s® intent that these standards of practice for bat management by WCO’s will be accepted and recognized by governmental regulators and professional groups as the minimum definitive and technical standard for professional performance. NWCOA® has developed these Standards of Practice in hopes that they will be the most widely-accepted bat management guidelines in use by the nuisance wildlife control industry and related professions and be applied to all entities that provide wildlife damage management services on a commercial basis by regulatory authorities. 1. I will strive to follow all laws, regulations and the National Wildlife Control Operators Association Professional Standards of Practice for Structural Bat Management in both commercial and residential structures. 3. I will show exceptionally high levels of concern and respect for people, property and bats. 4. I will promote the understanding and appreciation of the many values of bats and scientific wildlife management, as well as an appreciation for the economic and health concerns of people adversely affected by bats. 5. I will be sensitive to the various viewpoints of bat damage management. 6. I will provide expertise on managing bat damage to my clientele upon request, within the limits of my experience, ability and legal authority. 8. I will strive to broaden my knowledge, skills and abilities to advance the practice of commercial bat damage management. 9. I will, in good faith, select new or time proven methods for resolving bat damage conflicts and give due consideration to humaneness, selectivity, effectiveness and practicality. 11. I understand that my title of Bat Standards Compliant pertains to me only and that only persons that have taken the course and successfully passed the test will be considered Bat Standards Compliant. 12. I understand that not all bats leave their roost at night and that waiting until after dark to seal the structure is not an approved bat standard by NWCOA. 13. I will encourage, through word and through deed, all Commercial Wildlife Control Operators to adhere to this standard and to participate in NWCOA Certified Training Courses. 14. I will maintain adequate insurance and will provide proof of insurance to NWCOA if requested by NWCOA. 15. I further understand that if I do not follow the National Wildlife Control Operators Association Professional Standards of Practice for Structural Bat Management or adhere to this code of ethics my status as NWCOA Bat Standards Compliant will be reviewed by the NWCOA Certification Review Board and may lose my status as Bat Standards Compliant and any rights to be listed on the NWCOA web site or use the NWCOA Bat Standards Compliant logo.